This variant is a work in progress and comments are welcome. It was inspired by Charles Gilman's Honeycomb Chess. 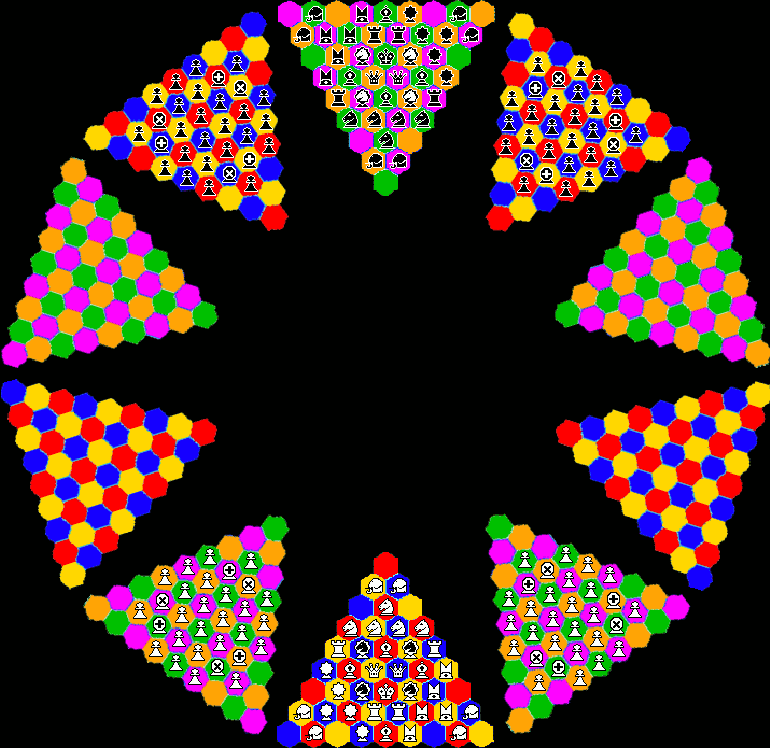 I have extended the board to 10 levels with each level composed of 45 hex-prisms, and joined the last level to the first level to form a ring or torus-like construct. The image on the right illustrates the 2 basic movements, orthogonal and diagonal, and also the Knight's move. 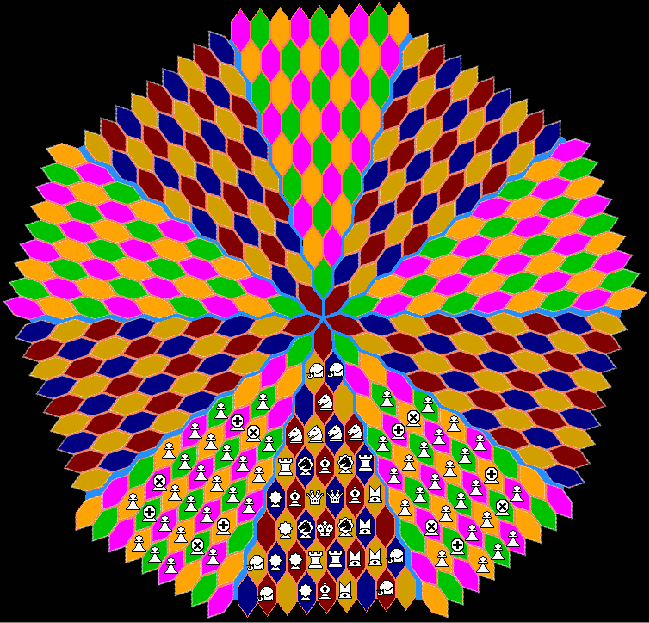 Orthogonal moves are made by passing through a face to an adjacent hex-prism cell. There are 8 orthogonal directions and the Black Wazir at Hb2 can move to the cells with a white dot. Diagonal moves are made by passing through an edge to an adjacent hex-prism cell. There are 12 diagonal directions and the White Ferz at Hb7 can move to the cells with a blue dot. The Knight moves 2 steps in any orthogonal direction followed by 1 orthogonal step at right angles to the initial direction. The Knight can thus reach a maximum of 24 cells One-half of the moves available for theWhite Knight at Ie3 are shown by the red dots. king 1 1 step in any direction. rook 4 up to 8 steps in a single orthogonal direction. May not leap intervening pieces. knight 5 2 steps in any orthogonal direction followed by 1 step at right angles. May leap intervening pieces. bishop 4 up to 8 steps in a single diagonal direction. May not leap intervening pieces. elephant 6 2 steps in a single diagonal direction. May leap any intervening piece. ferz 6 1 step in a diagonal direction. guard 5 1 step in any direction. wazir 6 1 step in an orthogonal direction. minister 5 as either ferz or elephant. horse-guard 4 as either guard or knight. queen 2 as either bishop or rook. pawns 48 1 step forward, either orthogonally when not capturing, or diagonally when capturing. The game sounds and looks complicated. Does it have to be toroidal? By the way, what do you think of S Courier Chess ? This looks like a nice variant. When I get my own computer back from the shop in a few days, I'll be happy to play a game with you. May ask you to play one of my odd games - a comparable one - as a swap, but, as always, that's up to you - I'll take or issue you you a challenge for SC Chess soon anyway. Yes, I think it is complicated - but then I'm beginning to suspect that any variant in more than 2-D, especially with unusually shaped cells, may be essentially too complex to play "just for fun". Really I started this variant because I was intrigued by the board and the possibility of circular 3-D chess. 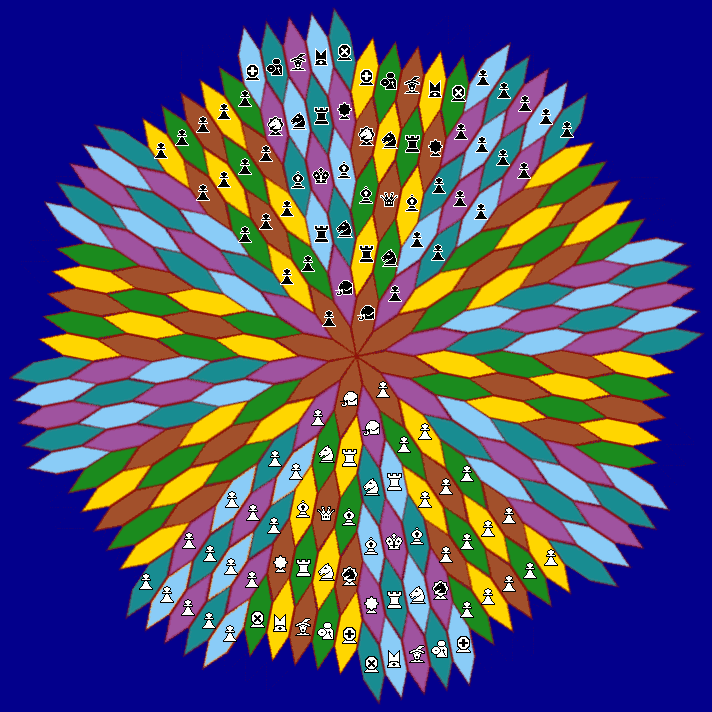 I also liked the board graphicss with the radial-hex tessellation. S Courier looks a very playable variant,but I'll add my comments to the page itself.